Jamun is one of the popular wild fruits in India is known by many names like Jambool, Java plum, Black plum and many other vernacular names. The leaves which have antibacterial properties are used to treat teeth and gum disorders. Containing tannins and Gallic acid, the tender leaves of Jamun tree are administered as a medicine for treating dysentery and diarrhea. This Ayurvedic herb, is most popular as a fruit, which grows in specific seasons and is sweet and acidic. The high Iron content in these fruits helps fight liver and heart diseases. The diluted juice of the fruit when applied can cure ringworm. Even the seeds of this fruit when powered and consumed are a treatment for poly-urea or excess urine production. But beware not to over eat this fruit, as it might lead to cough with expectoration. The tasty and pleasantly flavoured fruit is mostly used for dessert purposes. 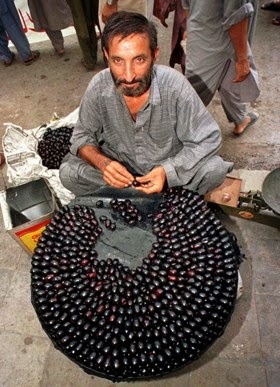 The jamun fruit has sub-acid spicy flavour. Apart from eating fresh, it can be used for making delicious beverages, jellies, jam, squash wine, vinegar and pickles. A little quantity of fruit syrup is very useful for curing diarrhoea. A mixture of jamun juice and mango juice in equal quantity is very useful for quenching thirst for diabetic patient. 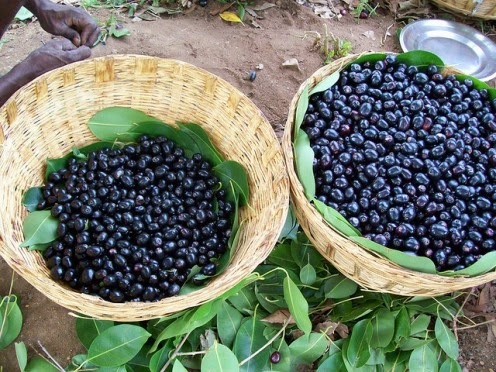 Jamun is used for preparation of wine particularly in Goa. The vinegar prepared from juice extracted from slightly ripe fruits is stomachic, carminative and diuretic, apart from having cooling and digestive properties.Almost every part of the tree is used for one purpose or other. A tree made of tender leaves and alcoholic extracts of leaves and fruits is used in South America for curing the stomach disorder. The seed powder of jamun reduces the quantity of sugar in the urine very quickly and permanently. It is used as a lotion for the cure of ring worm. 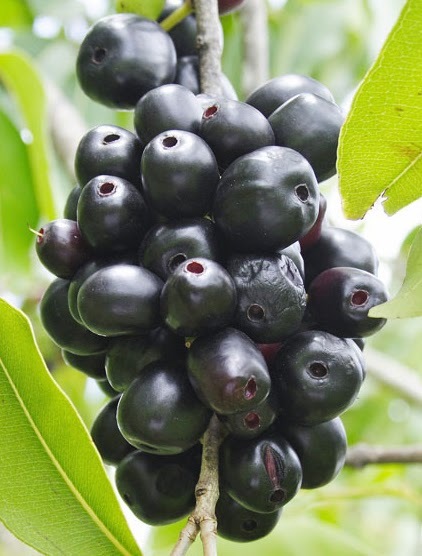 Jamun seeds can be used as a concentrate for animals because itis rich in protein, carbohydrate and calcium. Jamun is an evergreen tree and can be planted both in spring i.e. February -March and the monsoon season i.e. July-August. The latter season is considered better as the trees planted in February- March have to pass through a hot and dry period soon after planting. Prior to planting, the field is properly cleared and ploughed. Pits of 1 x 1 x 1 m size are dug at the distance of 10m both ways. Usually, work of digging of pits is completed before the onset of monsoon. The pit are filled with mixture of 75% top soil and 25% well rotten farmyard manure or compost. Another common way of growing jamun trees is to plant them as shade trees near the farm dwellings and wells. Here they provide a welcome shadow besides fruit. 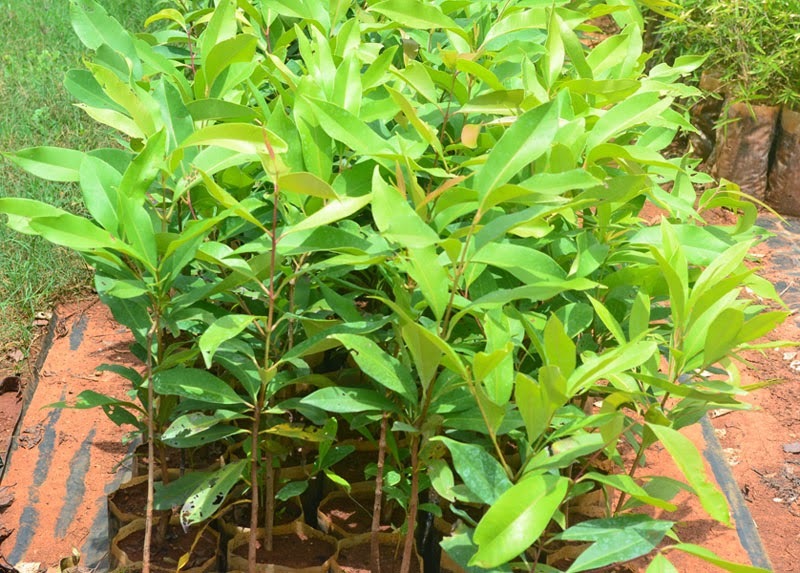 Plant and gift a Jamun tree today. Planting fruit trees helps combat hunger, poverty and global warming. Did you know a tree sequesters about 1 ton of carbon and processes enough oxygen for two peoples requirements in its life-time?